Fire Dances are in many places and in many forms. 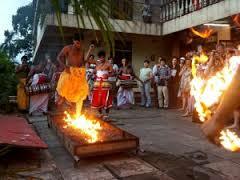 Both in Africa and in Europe is danced around fires and embers. From the Balkans to Greece, there are still places where the fire dance is done. During a trip to Bulgaria you can experience yourself the vibrant and colorful culture of Strandja and their traditional fire dance. Nestinar (so are the dancers called) fire dance is one of the most special cultural celebrations in Strandja, and in Bulgaria. The Nestinarstvo (fire dance) is an ancient tradition that dates back to the times of the Thracians. Nestinar is now celebrated on the day of the saints, St. Constantine & St. Elena, at the beginning of June in the village of Bulgari. The fire dancers come in a trance and dance to ancient drum and bagpipe rhythms on hot coals while carrying around the icons of the saints. This unique Nestinarstvo ritual was recently listed by UNESCO in the list of the "living" World Heritage.